Marble Services Offered Include : Marble cleaning , Marble polishing, Marble restoration , Marble flattening , Marble grinding , Marble repairs , Marble filling holes , Marble fixing cracks and Marble maintenance schedules Granite Services Include : Granite cleaning, granite polishing, Granite grinding, granite repairs, granite restoration, fixing granite holes & cracks , Granite maintenance schedule Limestone Services Include : Limestone cleaning, Limestone polishing, Limestone restoration , Limestone grinding, Limestone repairs, Limestone filling holes, Limestone fixing cracks, Limestone flattening , Limestone maintenance schedule Salturnia Services Include : Salturnia cleaning , Salturnia polishing , Salturnia restoration , Salturnia flattening, Salturnia grinding, Salturnia filling holes, Salturnia fixing cracks, Salturnia repairs, Salturnia maintenance schedule Terrazzo Services Include : Terrazzo cleaning, Terrazzo polishing, Terrazzo restoration, Terrazzo flattening, Terrazzo grinding, Terrazzo filling holes, Terrazzo fixing cracks, Terrazzo repairs, Terrazzo maintenance schedule Travertine Services Include : Travertine cleaning, Travertine polishing, Travertine restoration, Travertine flattening, Travertine grinding, Travertine filling holes, Travertine repairs,Travertine fixing cracks, Travertine maintenance schedule Grout Cleaning, Restoration, & Repair Services Include : Grout cleaning, Grout pressure washing, Grout sealing, Grout stain sealing, Grout dyeing, Grout replacement, Grout fixing cracks, Grout maintenance schedule Tile Cleaning, replacement, Installation and repair Services Include : Tile cleaning, Tile replacement, Tile Installation and Tile Repair. commitment of your crew...truly a group of qualified and reliable professionals. 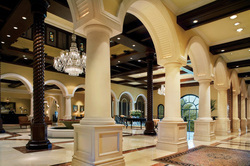 exceeding... our famous Ritz-Carlton standards for quality and perfection." 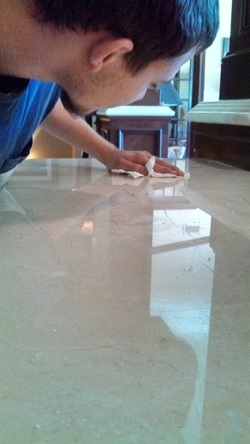 ​Extraordinary job refinishing our travertine floors throughout the house . Floors looked better than new after they finished. Wonderful to work with - highly recommend!! “I would like to give a 5-star review to be posted, for a job well done! Everything was done to PERFECTION !! It was a pleasure to deal with Francisco Garcia were very easy to have in the house. Marble Floor Restoration Since 1990 Marble Services Offered Include : Marble cleaning , Marble polishing, Marble restoration , Marble flattening , Marble grinding , Marble repairs , Marble filling holes , Marble fixing cracks and Marble maintenance schedules Granite Services Include : Granite cleaning, granite polishing, Granite grinding, granite repairs, granite restoration, fixing granite holes & cracks , Granite maintenance schedule Limestone Services Include : Limestone cleaning, Limestone polishing, Limestone restoration , Limestone grinding, Limestone repairs, Limestone filling holes, Limestone fixing cracks, Limestone flattening , Limestone maintenance schedule Salturnia Services Include : Salturnia cleaning , Salturnia polishing , Salturnia restoration , Salturnia flattening, Salturnia grinding, Salturnia filling holes, Salturnia fixing cracks, Salturnia repairs, Salturnia maintenance schedule Terrazzo Services Include : Terrazzo cleaning, Terrazzo polishing, Terrazzo restoration, Terrazzo flattening, Terrazzo grinding, Terrazzo filling holes, Terrazzo fixing cracks, Terrazzo repairs, Terrazzo maintenance schedule Travertine Services Include : Travertine cleaning, Travertine polishing, Travertine restoration, Travertine flattening, Travertine grinding, Travertine filling holes, Travertine repairs,Travertine fixing cracks, Travertine maintenance schedule Grout Cleaning, Restoration, & Repair Services Include : Grout cleaning, Grout pressure washing, Grout sealing, Grout stain sealing, Grout dyeing, Grout replacement, Grout fixing cracks, Grout maintenance schedule Tile Cleaning, replacement, Installation and repair Services Include : Tile cleaning, Tile replacement, Tile Installation and Tile Repair.